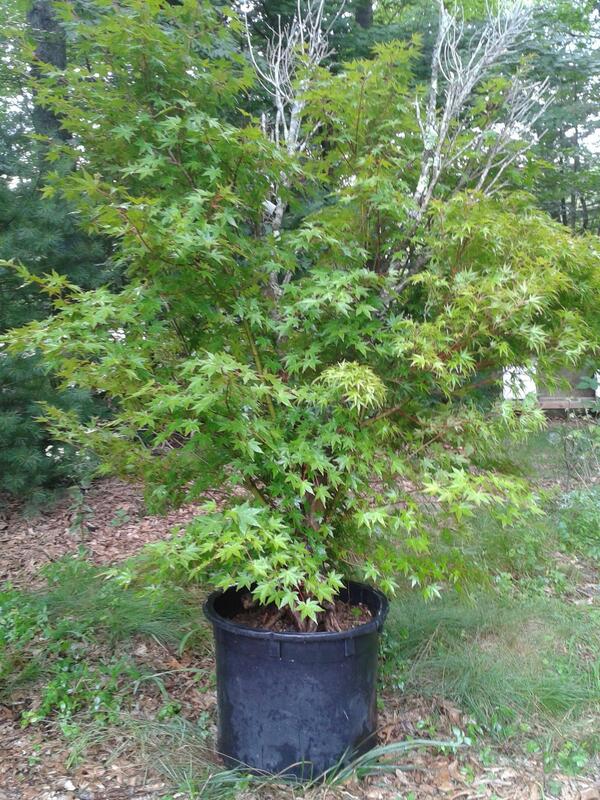 Anyways I live in a zone 5/6 in the USA, and recently bought a very large Green Japanese Maple. It is about 6 feet tall and with a 5-6" trunk, and has lots of promise. The main trunk has died back, and was left with lots of shoots growing off of the lower trunk, which is perfect for my intentions, however these shoots are now about an inch thick and 4-5 feet long. Obviously I need to cut them back severely. It is also extremely root bound. It is growing in what I can only guess is a 20 gallon pot (~22"x17"), and when I bought it it was rooted into the ground with 3 large roots that had to be cut, so I obviously need to do some cleaning up of the roots as well. 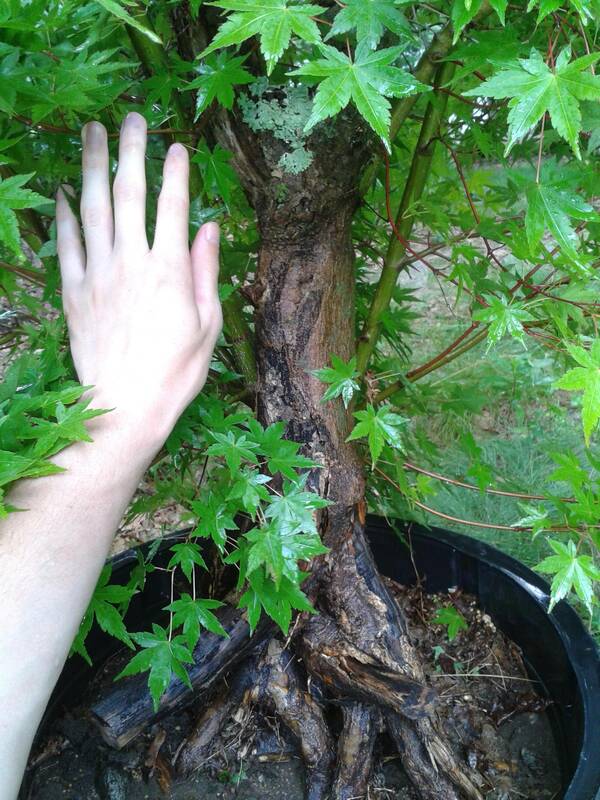 When I first got into bonsai, I was taught to do most major pruning in the beginning of the year on deciduous trees, when the buds first begin to swell, however since I have never worked on something as big (or expensive) as this before, I decided to do some research to find out if doing a major root prune and major cut back up top would be too much and when the best time to root prune is. I am finding conflicting answers, many people say during fall/winter when the tree is dormant, some people say the beginning of summer when it is growing quickly, some say the beginning of spring like I had thought, and some say to NEVER do heavy pruning in the beginning of the spring. So what should my time scale on this be? Root prune and hack the top back at the same time? And when is best? Spring is safest and may be best. Lots of plants (e.g., roses and azaleas) can be transplanted in August/September; some, such as mugo pines do best when repotted (including root pruning) in July/August. A common practice with 'emergency' transplantation of deciduous trees is to defoliate them when transplanting to prevent dessication. The tree has more stored energy (starch) later in the growing season. Pruning in dormancy may make the tree vulnerable to pathogens invading at the cuts (i.e., little or no metabolic activity to 'self-seal' the pruning cuts. I think these are are facts you must consider in deciding what you are going to do. My own experience is that JMs are very susceptible to dessication. Thanks for the reply, I will have to take that into consideration, and I will probably end up doing all of this in the spring. I wish I could see what my rootball looks like without, well you know, removing it from the pot. I don't *think* it needs an emergency transplantation, but I have only owned it here for a few days so it is hard to say for sure. I have been watching it closely for any sign of wilt after cutting those large roots that escaped the pot at the nursery. My main fear is that the reason the trunk died back was because it was so root bound, but then was able to break a few roots through the bottom of the pot which is what caused the grow back. So now I fear that since we cut the roots that broke out of the pot, it is back to its severely root bound state. If it begins to show any negative signs, I will give it an emergency root pruning this year and then give it some extra winter protection, otherwise I will let it set until next spring when I originally intended to do this. And like always I will use sealant to help keep pathogens out. This is a picture of the tree in its fullness that I took the other day so you can get an idea of what I am dealing with here. This is a close up of the lower trunk, and branches that I will need to be cutting off/back. One of the best times to make a big cut is during a waning / almost new moon in late winter. Seriously. About 3-4 weeks before the buds swell. The key is to balance the amount of roots to the new amount of shoots. (like cut the 20 gallon pot in half). The tree will be better off for the from the big cut when the conductive tissue of the root system is cut back as the buds swell. This will keep the tree from "bleeding out" on the operating table. Thank you, I'm trying to think time scales in my head, about a month before buds begin to swell is probably beginning-middle of march? Is that about when you were meaning when you said "waning / almost new moon in late winter"? One of the best times to make a big cut is during a waning / almost new moon in late winter. Seriously. About 3-4 weeks before the buds swell. What's the moon got to do with it? Pull of the moon affects sap flow. Also, stem elongation, germination rates, flowering, etc. Seriously? I find this very hard to believe. The gravitational pull of the moon is about equivalent to holding a dime above your head. And the phase of the moon has nothing to do with how close the moon is to the earth. I might be wrong, but unless you can cite this I am going to have a hard time believing it. It does control the tides..... Read any farmer's almanac, anything by Pliny the Elder, the Chinese, etc. I'm a very science and proof based person. Sap flow is higher during a full moon. Feel free to prove me wrong. I first heard about it from my Grandfather who is an intense gardener and was skeptical. Google it. It actually kind of does make sense Owen. Besides the fact, being an apprentice at a high profile nursery in Japan should give you some credibility. Did some quick research (interesting article that generally outlines the basics here - http://www.marshallindependent.com/page/content.detail/id/539777/What-does-the-moon-have-to-do-with-it-.html?nav=5073) and it sounds like the moon phases can impact whether root growth is stimulated or leaf growth. "Basically, when the moon is increasing in light, the moonlight stimulates leaf growth, and as it decreases, the root is stimulated to grow again." So acording to this logic, if you do a big chop when the moon is waning, it is in a period when growth is focused on the roots rather than foliage and might be more beneficial in recovery as a result of reduced sap flow (since it is focused on the roots) as Owen mentioned. At least this is how I understand it, I might be off base as I am just doing some preliminary reading on this. A waning moon? What a downer. It does make sense. Owen is spot on. I have done it in the fall as well and just let the leaves fall off. I live in pacific north west. Quite a nice fall to work around. Oh, its a bunch of horse pucky. The gravitational changes are parts per million. It makes a big difference in the tides because it invoves connected bodies of water the size of the earth. Check the tides in your glass of water. Ha ha, Owen! Good one!